Like most fancy-pants wanna-be’s, I often read recipes in the New York Times dining section and think “Yes! I am SO going to make that!”. Then I get distracted by work or something sparkly out of the corner of my eye and forget all about it. Not this time! I saw Melissa Clark’s recipe for corn ice cream and knew I wanted to try it. I also knew that Matt would be totally game because A) he’s always up for a challenge and B) he loves both corn and ice cream. We had a a few ears of (not that great) corn that we bought in Long Island, so we decided to give this a try. It’s really good! It’s a tiny little bit under-sweetened to my taste (unusual for me) but that could be because the corn we used was not that sweet to begin with. 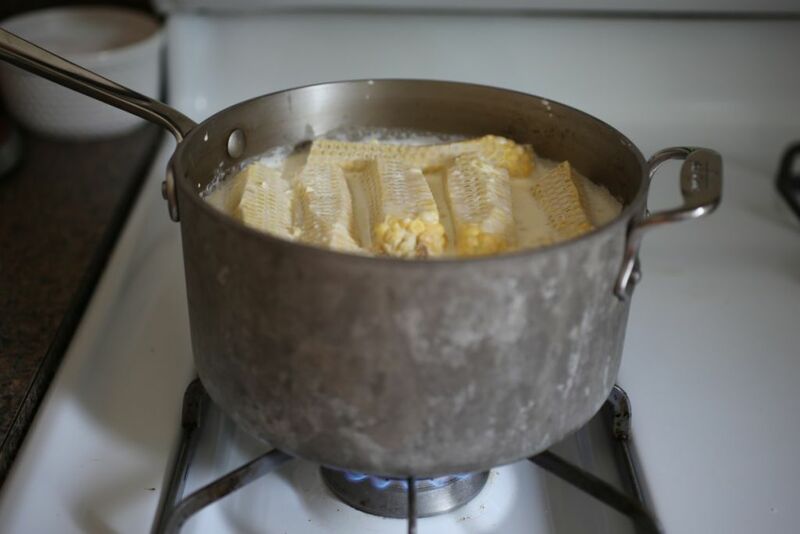 If I make it again (with under-whelming corn), I would add a touch more sugar. Maybe just a tablespoon or so. Or, even better, I’ll leave it as-is and pour a bit of this (elixir of the gods) Salted Caramel Sauce on top. Bring mixture to a boil, stirring, then remove from heat. Let stand to infuse for 1 hour, then discard corn cobs. Return mixture to a simmer, then turn off heat. 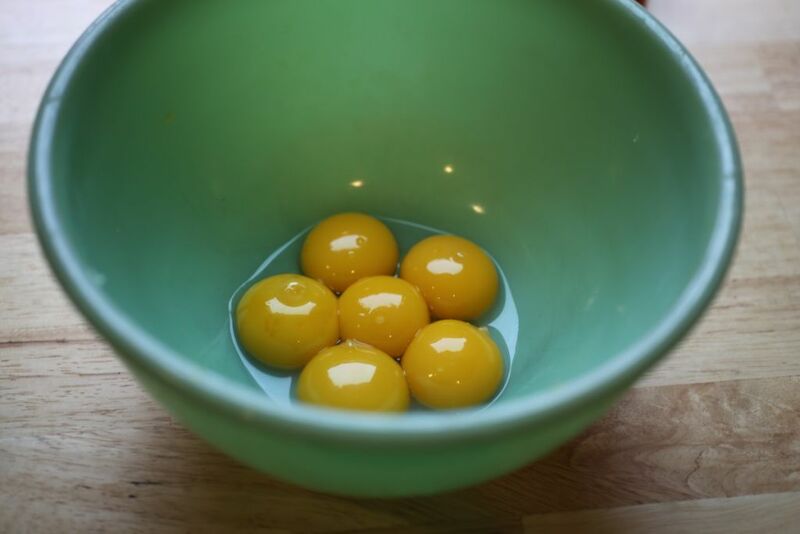 In a small bowl, whisk egg yolks, ⅛ teaspoon salt and another ¼ cup of sugar. Add a cup of hot cream mixture to the yolks, stirring constantly so they don’t curdle. Add yolk mixture to saucepan, stirring. 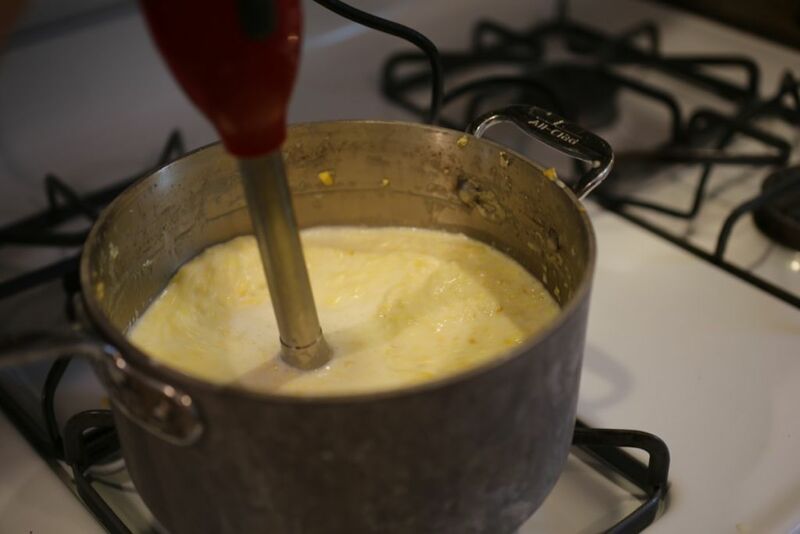 Cook over medium-low heat, stirring constantly, until custard thickens enough to coat the spoon, about 10 minutes. Pass custard through a fine sieve, pressing down hard on the solids. Discard solids. Whisk in vanilla and sour cream until smooth. 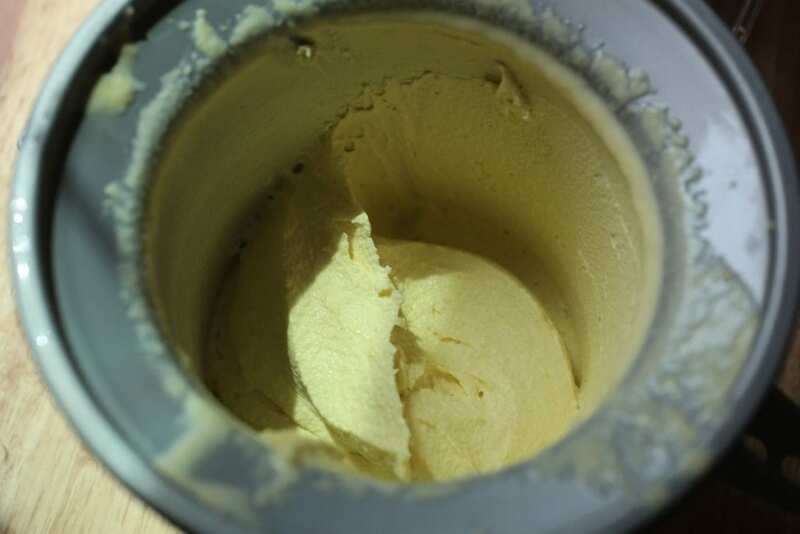 Freeze the custard in an ice cream maker (use the directions for your specific model). We have an attachment for our Kitchen Aid stand mixer, which works pretty well. Once the custard is a soft-serve consistency, move it to an air-tight container and freeze for another couple of hours. ***Full disclosure. Our custard totally separated when we cooked it, though it was initially hard to see because of the corn bits. I was ready to admit defeat, but Matt re-emulsified the mixture with the immersion blender and it ended up being fine. Yay Matt! Yay immersion blender! 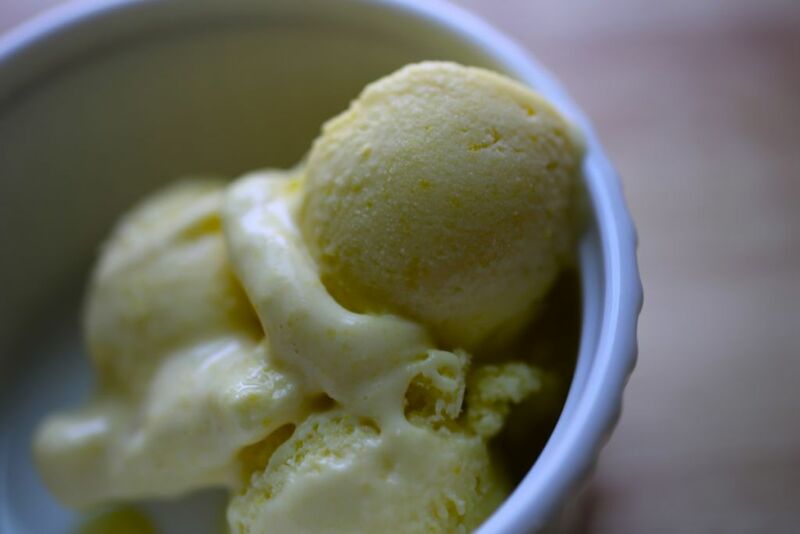 The colder the custard is before you freeze it, the smoother the your ice cream will be so refrigerating it overnight is a good idea. If you don’t feel like making the Salted Caramel Sauce, some blueberries or blackberries on top would work well. If you wanted a quick fruit sauce, heat a 1/2 pint of them with a about a tablespoon of sugar and a teaspoon of lemon zest and juice. Just cook them until the fruit bursts and the sugar melts.